Every Sunday morning I wake up to Krista Tippett’s radio show On Being. At first, as a not-particularly-religious person, I was a little irritated that my local radio station, WAMU, added this to its Sunday programing, but I quickly got over that irritation. Her show is not just about faith and religion and god(s) and spirituality, it’s about how to live a good, meaningful life. I love the show now, and learn something each week. Recently she re-ran a couple of shows featuring Georgia congressman and civil rights pioneer, John Lewis. You’ll find “We are the beloved community” here, and “The Art and Discipline of Non-violence” here. The conversations ranged from his childhood in Alabama, with his sharecropper parents, and his experiences being turned away from his public library as a boy, to his work with Dr. Martin Luther King, Jr., in the civil rights era. 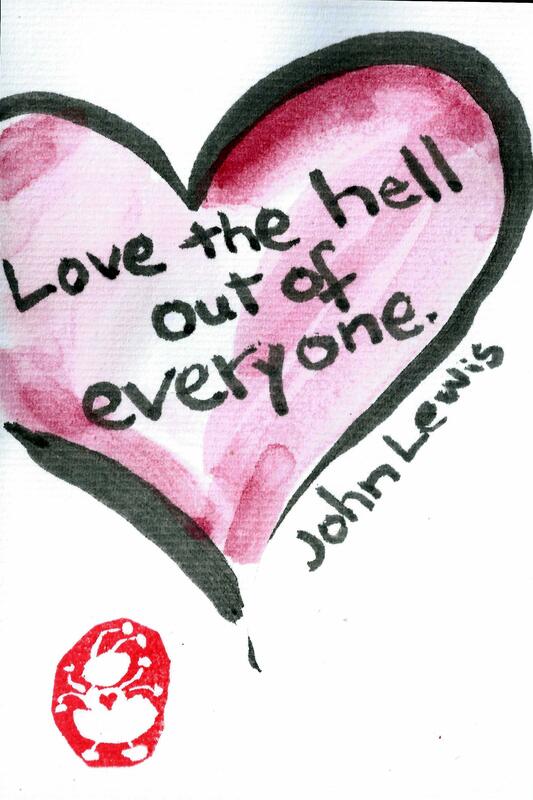 One line from John Lewis struck a chord with me — Love the hell out of everyone. He was calling for radical love, love that can transform the lover and the loved. Explicit through the conversation is the idea that you even love those who hate you, who wish you ill. You literally love the hell out of them. I later learned that Representative Lewis was really quoting something that Dr. King used to say. 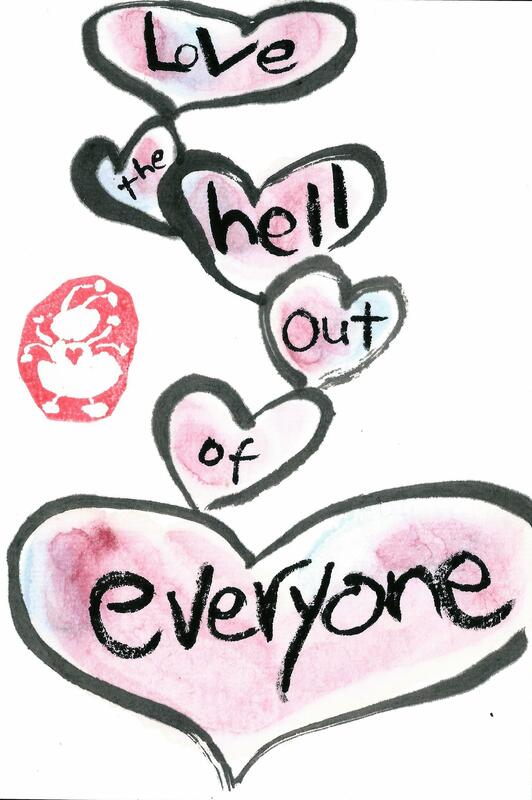 “Love the hell out of everyone” — this is a challenge I took with me from the On Being conversation with Representative Lewis. How can we love those who are full of hate? How can we work to root the hell that we may have inside ourselves? How can we have how to have generative conversations to move away from the toxic political environment we live in? I don’t know but I’m working on it. I painted a few etegami with these words — not quite a Valentine’s day sentiment for your sweetie, but maybe one for the rest of you all.